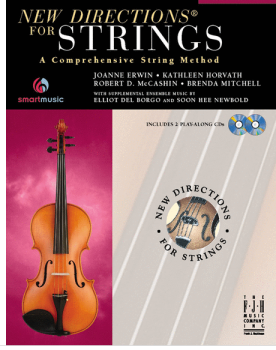 The FJH Music Company is proud to present New Directions for Strings, the first string orchestra method book written by a team of pedagogues representing each of the four stringed instruments. With more than 100 years of combined teaching experience, the authors of New Directions for Strings explore many new directions, including equal integration of all the instruments, a tetrachord-based approach to support proper development of the left hand, and ensemble opportunities that occur throughout the book. Supplemental music by Soon Hee Newbold and Elliot Del Borgo. Includes 2 Play-Along CDs.